Hop Along impress on an album that draws from their previous work whilst taking bold new strides in their storytelling, instrumentation and structure. On their third album, Philadelphia indie outfit Hop Along produce a complex, layered work of art that stands shoulder-to-shoulder with some of indie rock’s finest. Each song is densely packed with musical variety, lush instrumentation and quirky charm, tied together by a truly fantastic vocal performance from lead singer Frances Quinlan. Quinlan’s vocal presence on this album cannot be understated. Her voice leaps and bounds throughout each track, delivering a mixture of the intensely personal and the far removed nature of her lyricism. We hear her voice multiplicate in echoed choruses, bend and break in passionate bursts, or plainly tell cryptic stories about broken people. 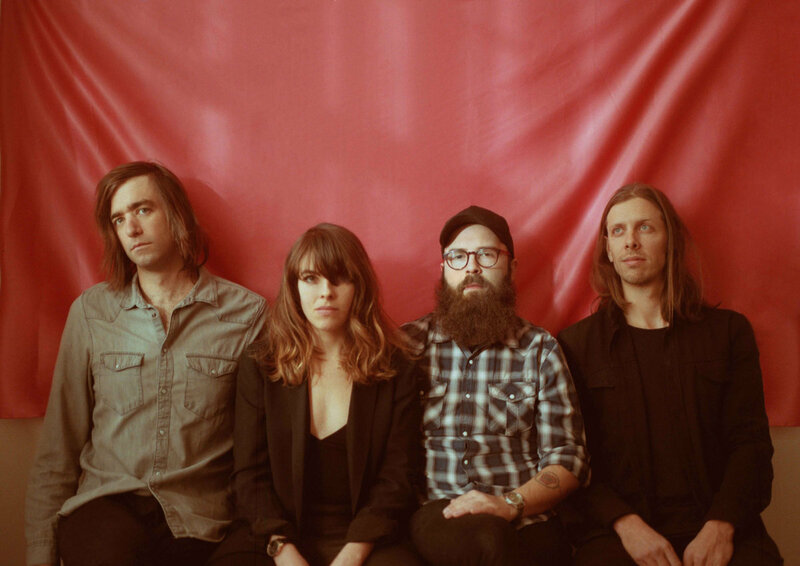 Quinlan’s strength lies in her distinct vocal style, but her lyrics and songwriting quirks are what give Hop Along’s songs a uniquely personal character. Their almost poetic phrases rival early Los Campesinos in their directness, playing over in the mind long after the first listen in their catchiness as well as relatability. Songs like album opener ‘How Simple’ are perfect representations of Hop Along’s growth as a band on Bark Your Head Off, Quinlan’s vocals acting as an anchor within throes of dense, frantic instrumentation. This energy is resolved in splutters of confessional lyrics (“Pale as the banshee sun / Think I should stop checking myself out / In the windows of cars / When I could see my future in pictures of relatives”) and ultimately in a buoyant yet bittersweet chorus about growing out of teenage romance – “We will both find out / Just not together”. These lyricisms are accompanied by deft guitar work from Joe Reinhart, an impromptu and off-kilter solo taking centre stage for a few moments, before handing the reins back to Quinlan. Throughout the album the band is supported by a string section, that adds a textured, orchestral feel to their work – presenting the stories presented in each song as melodramatic epics, the everyday elevated to grandiose status. This feeling is aided by some quirky song structures, such as on ‘Not Abel’, where a folksy, occasionally orchestral first half rapidly metamorphoses into a sing-along final few moments. Such quirkiness is present on nearly every song, such as the math-rock infused opening to ‘What The Writer Meant’, reminiscent of American Football or This Town Needs Guns. Equally enjoyable is the infectious rhythm held in the shakers of ‘The Fox In Motion’, or the acoustic honesty of ‘How You Got Your Limp’ – the album surprises on each listen, details previously missed suddenly springing out. This is not just true of the instrumentation but also of the lyrical themes present on the album. Hop Along have stated that this album is about how it is ‘so strange to be shaped by such strange men’, a motif that appears on almost every song in an indirect sense – most prominently on ‘Somewhere a Judge’, Quinlan poetically detailing “8 executions by drug to beat the expiration / A shelf life of reason, is that what this was Arkansas? / Somewhere a judge stretches himself out on fine tropical sand”. Referencing the killing of 8 inmates in Arkansaw to meet the expiration date of a lethal injection drug, Hop Along encompass this theme – of seemingly distant figures altering people’s lives at a moment’s notice. It’s incredibly difficult to pick out highlights on the album, but not for want of trying, as it seems determined not to waste the listener’s time in picking out a near-perfect crop of highlight after highlight. It’s punchy and straight to the point without a weak link in sight – each song unique and engaging without ever slowing down, a perfect mix of vocal stylishness with instrumental prowess on each track. Bark Your Head Off, Dog sits comfortably within Hop Along’s already impressive discography, each album iteratively building on the last, expanding and tweaking the sound in ever more exciting ways. I can’t wait to see where they’ll go next.